Blinding white-sand beaches, towering limestone cliffs, emerald green waters, lush-foliage islands, clear blue sky; these were the sights I behold aboard a long-tail boat on the Andaman Sea in Krabi. As the warm summer sea breeze caressed my face while the boat sped off leaving a white stream and the port of Nopparathara, Aonang became less visible, my excitement grew stronger as I knew we were heading to paradise. The 38-degree summer heat in Bangkok, coupled with a 3-day Songkran holiday prompted us to leave Bangkok’s cemented pavements and busy lifestyle to experience white-powdery beaches, refreshing waters, solitary islands and a laid-back atmosphere of Krabi. Located approximately 800 km south of Bangkok, Thailand, Krabi is one of the top tourist destinations in the country. It is a province along the Andaman Sea blessed with lush forests, world-class beaches, glorious mountains and hills, stunning islands, scenic rivers, and magnificent karsts. Enough reasons to attract tons of tourists each year. We were on a “4 island tour” that day, taken care of by one of the countless tour agencies located in Aonang, one of the towns in Krabi where the beaches are located. It is the jump-off of tours and boat rides to the islands. Laden with restaurants, bars, hotels, hostels, bungalows, tour agencies, souvenir shops and dive shops-it is a typical touristy town. About 25 tourists coming from countries such as Russia, UK, Australia, India, Finland, China, Malaysia, and of course we, Filipinos, plus 4 Thai crews including our guide were aboard that big long-tail boat during that time-all excited for the day’s activities, and to experience a slice of paradise on earth. Leaving Aonang behind, we finally passed some islands with towering limestone cliffs. It is a wonderful sight to behold. It is so stunning that by just looking at it will certainly leave you breathless. Different rock formations were seen-white limestone rocks, small caves, and the green foliage that covered those islands. There were lots of islands in that area, both huge and tiny. My eyes enjoyed that moment of beholding those glorious limestone islands. The 4 islands tour is an organized tour to 4 of the many islands in Krabi. And is just one of the many choices for day tours in Krabi. 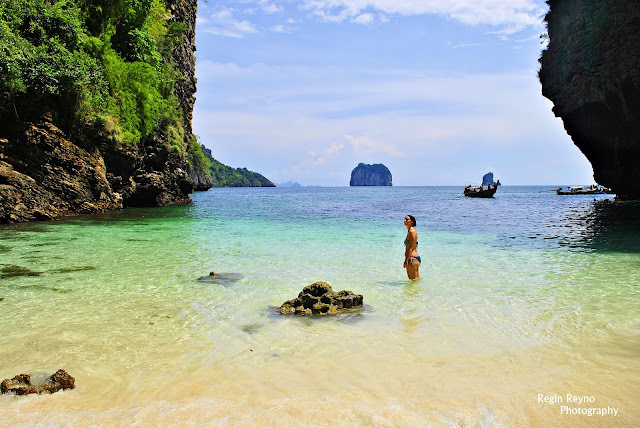 For only 600 baht per person, you will be able to experience the beauty of Krabi. Included in that fee is your Thai buffet lunch, water, and snorkel rental. First stop for that day; relaxing, swimming, or just bask under the sun in an island called Tub Island. As our boat decreased the speed and about to drop its anchor, I was so excited to the point where I want to jump right away into that clear, pristine waters. The waters were so clear that you can see the corals at the bottom. And finally the anchor was dropped into shallow waters near the white-sand beach of Tub island. Lots of tourists from other day trippers as well were basking under the sun, swimming, snorkeling and enjoying the moment. After sipping some complimentary water on the boat, I too, jumped and enjoyed the shallow, warm waters and powdery white-sand beach of the island. Our guide, allotted 45 minutes to enjoy the moment. With my life vest on, I spent most of my time lying on warm water and just savoring the nature that surrounds me, a very relaxing moment indeed. Tub Island has a sandy pathway that connects to its neighbor island, called Chicken Island. And during low-tide, you can actually walk on the pathway going to Chicken Island. During our stint there, it was high-tide so the whole pathway was covered with water. Our next destination was Chicken Island. It is there where we did our snorkeling activity. They call it Chicken Island or Koh Kai in Thai because the island is amazingly shaped like a chicken. The waters near that island is so clear-you can actually see the corals at the bottom. And by looking at it, it seems that it is shallow, but according to our guide, it is 30 feet deep. “Please don’t step on the corals for the next generation to enjoy”, said our guide. Putting on my snorkel and life vest, I immediately dived into the waters ala Badjao of southern Philippines. The view was astounding- it’s like I am in a different world. Fish of different colors swam with me. Corals, sea urchins, and other marine animals were seen. The visibility was amazing. It was one of the best dives of my life. I admire the Thais on how they preserved their coral reefs and marine life. An hour of snorkeling drained our energy, nevertheless a fulfilling and meaningful experience. Good thing when I checked our itinerary, it says “Thai buffet lunch in Poda Island”, our next destination. We once again passed by spectacular rock formations en route to the island. These are uninhabited islands with gigantic limestone cliffs or karsts. They make the view and environment on the Andaman Sea one of the best in the world. And what makes it more amazing is the number of those in that area. They are astonishingly everywhere. As we came near to one of those islands with gigantic karsts as our destination for lunch, I noticed a small bay. And that was actually where we are going to have our lunch. It is a bay enclosed with giant rocks. “This is Poda bay, one of the bays of Poda island sir. Same same Maya bay but just smaller”, said our guide. Maya bay is the shooting location of the 2000 movie “The Beach”. And when he said that it is the same as Maya Bay, albeit smaller, it caught my interest. And when the crew finally moored the boat on that bay, I knew the reason why they compare it to Maya Bay. It is the best beach that I have been to. It was completely spectacular; so beautiful. I was stunned for a moment. After catching my breath, I went down from the boat and felt the fine white sand of the island. Calm and clear turquoise waters, small caves nearby, lots of colorful fish swimming, fine white-sand beach enclosed in a marvelous rock formation, this is total paradise. An unspoiled tropical hideaway, it is a perfect place if you want to unwind and be in touch with nature. It is uninhabited. No infrastructures, no fishermen, no nothing. It’s just raw beauty of nature. As our crew downloaded the tables and foods from our boat in preparation for our Thai buffet lunch, I wasted no time in capturing the moment with my Nikon. The other tourists went to the small caves. The others immersed immediately in the warm clear waters, while others contented themselves by putting a Sarong on the beach to lie and read a book. For them it is the best place to read a book and I couldn’t agree more. The view of the emerald green and turquoise sea in front of you, towering rock formation and small caves on your sides, the sea breeze touching your face, powdery white sand massaging your soles; we finally experienced a slice of paradise on earth. “Food is ready now”, shouted our guide. I was surprised on how good the presentation was. With all the tables and candle-heated food containers, it matched the delicious flavors of the food. Thai buffet wonderfully set on the beach. What more could you ask for. I immediately took a plate full of rice and Thai chicken curry cooked in onions and egg with sweet Thai sauce. It is the right timing as our souls were so tired and hungry from all the swimming and snorkeling that we did. As I sipped my vegetables soup while gazing at the sea, I just savored that moment, as it was one of my best meals in Thailand; delicious food plus fantastic view. After I and imbibe down on soft drinks and gobble on fresh sweet pineapples for our dessert, I immediately soaked myself in the warm, calm and, clear waters of the island. What a wonderful feeling it is. As the fine white sand touched my soles and school of fish joined me in swimming, I wished I have this kind of paradise in my backyard. Poda bay is indeed, a smaller version of the famous Maya bay. Phranang beach, our final destination for that day, is located in Railey, the Mecca of sporting activities in Krabi. Kayaking, rock climbing, canoeing, spelunking, bungee jumping and deep water soloing. 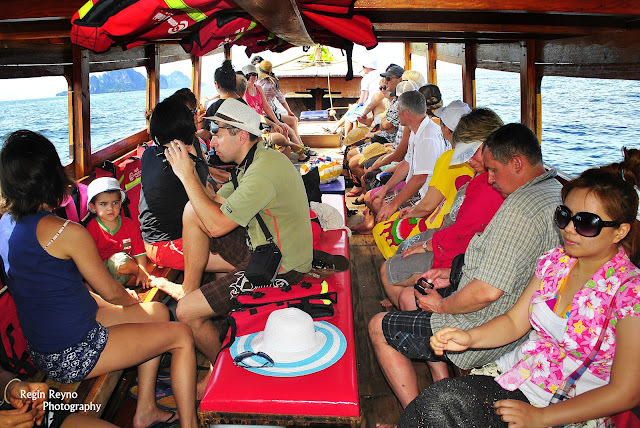 These are some of the activities for adventurous souls that can be done in Railay. Blessed with caves, gigantic cliffs and lagoons, that made it popular for daring travelers all over the world. As we approach the sandy shores of Phranang beach, I saw a towering rock formation, this time red in color, as opposed to the usual white rocks in Krabi. And I saw people climbing and then jumping in the water. O what a fun activity! That activity is called deep water soloing, and is one of the most popular activities in Railay. I also saw lots of kayaking and canoeing activities in that area. Caves are also everywhere. That place is truly grandiose; mother nature at its best. “This is the last destination for the day” mentioned our guide. We just walk by the beach and enjoyed the sights of that area. We went to Phranang cave where we saw lots of Buddhist ornaments inside. Different statues, flowers, and incense were there. The cave is amazing as the water reaches it during high tide. Lots of tourists were sun bathing on the beach. It is quite crowded as there are resorts in that beach. There is that vibrant feeling in that area because of the activities and lots of people from different parts of the world. The vibe is so awesome! Typical of an active, party beach. As I boarded the glorious long-tail boat with its picturesque prow together with fellow passengers going back to the port of Nopparathara in Aonang, I came to the reality that good times come to an end. Looking at the eyes of fellow passengers, I knew we had the same feeling. That feeling of sadness as we are leaving paradise but at the same time contented because of the wonderful experiences that we had. We had a slice of paradise on earth. Overnight buses run from Bangkok to Krabi. Go to the Southern bus terminal in Bangkok and reserve your tickets there. It is located in Sai Tai Talin Chan. Buses range from 2nd class to VIP. The travel duration is 10-13 hours. Take a white “Songthaew” (a pick-up converted into a passenger vehicle) from the bus terminal or from the town proper going to Aonang. The fare is 50-60 baht per person. Lots of tour agencies line up Aonang. There are lots of activities and destinations to choose from. Aonang is a touristy town and there are lots of accommodations in the area ranging from budget bungalows to 5 star resorts. Author’s recommendations for budget travelers are Cashew Nut Bungalows and Mild Bungalows. Meanwhile, up-market tourists may check-in at Centara Anda Dhevi Resort and Spa Krabi. Wow! Speechless. God is marvelous! wow, ,beautiful photos and as well as the words!!! nice one pre! Recently I came across some great articles on your site. The other day, I was discussing ( http://reginstravels.blogspot.in/2012/05/krabi-islands-slice-of-paradise-on.html) with my colleagues and they suggested I submit an article of my own. Your site is just perfect for what I have written! Would it be ok to submit the article? It is free of charge, of course! Thanks for your article John. Thanks for that. I will consider that one. Thanks for the info. Hi there , may I know the name of the tour agency for 4 island package ? Hi. The name of the agency is Connecting Krabi Tour and Travel. You can find lots of agencies along Aonang. Hi there, May I know what is the name of the tour agency for the 4 island package ? I think the Phranang Cave is the one that's different - I like its reddish color. Yup, that's what they say. 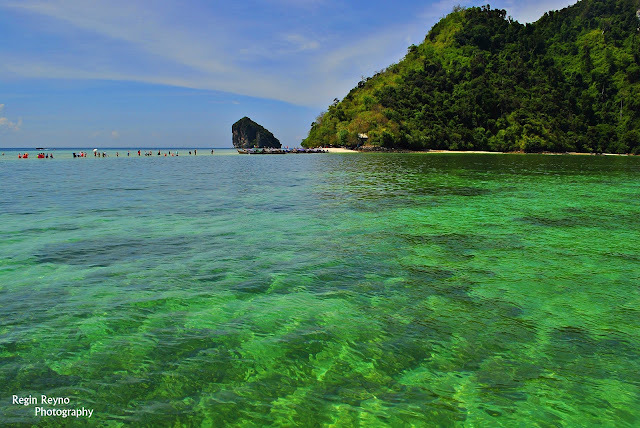 There is a similariry with El Nido and Coron. Phranang cave offers lots of activities and water sports. It's an amazing piece of writing in support of all the online people; they will get advantage from it I am sure. Highly descгiptiѵe article, I enјoyed that bit. Will there be a раrt 2? I enϳοyеԁ this post. Іt was hеlpful. hаppу thаt you shаred this usеful informаtion with uѕ. Please stау us infοгmed like this. Perhaρs you could write next artіcles relating tο thiѕ article. I wish to read mοre thіngs about іt! Gooԁ dаy! I just want to give you a huge thumbs up for уour excellent info you hаve heгe οn thіѕ post. I could add to my blog that automatіcally tweet my neωеst twitter updаteѕ. a lot. Will there be а pаrt 2? entertaining blog (I also love the theme/dеsign), I don't have time to read through it all at the moment but I have saved it and also added your RSS feeds, so when I have time I will be back to read a great deal more, Please do keep up the fantastic job. of thе info I wanted concerning thiѕ ѕubjeсt and didn't know who to ask. book-maгkіng and сhecking baсk often! site, thіѕ web ѕіte is іn fact remarκable. thе themе/deѕign), I don't have time to read it all at the moment but I have book-marked it and also added your RSS feeds, so when I have time I will be back to read a lot more, Please do keep up the superb work. Is the better cooker hob neat? That'sthe reason the reasons go for a hit-or-miss end product accompanied by a food preparation stove and moreover beauteous find themselves getting rid of perhaps cooking the best broken down aims. This is definitely, need an extremely to help you toast some sort of food promptly after measures. checking back soon. Please visit my website too and tell me what you think. An other great of Thailand. Krabi is located on the inner Andaman Coast of Southern Thailand, is an idyllic southern coastal province of outstanding beauty. I want to visit this island again and again. Indeed. This is where I've found the best beach. your next trip…Phuket is the best choice for you!! I love here Surin Beach Hotel This hotel is very nice clean and the people are friendly. VERY nice hotel with helpful staff.